Here, for your consideration, are three photos of the host of the cesspool program. 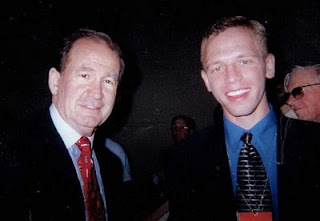 First, with his inspiration, Patrick J. Buchanan, for whose presidential campaign he worked in 2000. Next, posing with an anonymous friend apparently threatening to use baseball bats for something other than baseball. Last, a formal occasion with a confederate battle flag. Here's some more of what Buchanan's friend is saying about Jews. A higher percentage of abortion doctors are Jews, as compared to Gentile doctors. This is a statistical fact. My sense is that a higher percentage of doctors in general are Jews. Can you cite a source for your data concerning abortion providers, or are you relying on the Political Cesspool? I haven't heard back from that reader, so I can only assume that he is too busy with statistical research to reply.